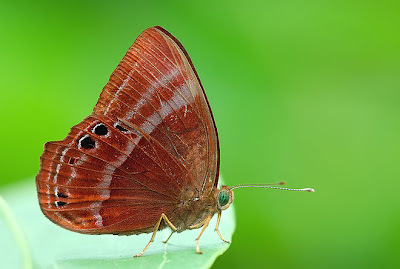 We start off the year 2008 with something auspicious and deep red - A small but nice maroon-coloured butterfly from the family Riodinidae. The species from this family are often referred to by their group common name of 'Metalmarks', probably due to the presence of silvery metallic-looking spots on the underside of the wings of some of the species in the family. The family is also characterised by a number of attractive and strikingly red and orange-red coloured species. The forelegs of the Riodinidae are imperfect and brush-like in the males, but are usually functionally perfect in the females. The 'Metalmarks' are confined to deep shady forested areas where usually they flit around on low level leaves. 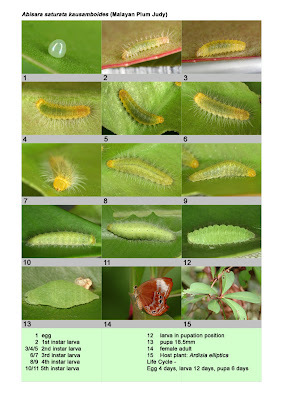 A characteristic behaviour is that the species of this family tend to stop on the uppersides of leaves with half open wings, and twist and turn with jerky movements. The upperside of the male of the Malayan Plum Judy, so named probably because of its deep plum-like colour, is deep crimson ; almost maroon, and unmarked. 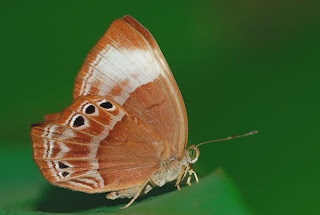 The underside is slightly paler, with a pair of diffused pale purplish post-discal bands and a series of black submarginal spots on the hindwings. In the much paler female, the forewing has a diffuse white subapical patch, and the transverse lines on the underside are broader and paler than in the male. In both sexes the hindwing is stepped out, giving an appearance of a 'tail'. In Singapore, the species is relatively widespread, having been found from the offshore islands of Pulau Ubin and Pulau Tekong, as well as many areas within the nature reserves as well as urban parks. However it is not common, and prefers to remain the shady understorey of forested areas, lurking in the undergrowth and at times, keeping still for long periods of time. Females are more often encountered than males. In Singapore, the species has been successfully bred on Shoebutton Ardisia - Ardisia elliptica (Myrsinaceae).